388 pages | 291 B/W Illus. 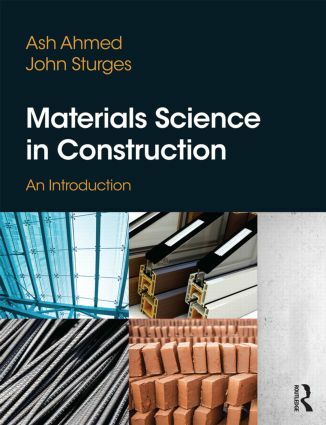 Materials Science in Construction explains the science behind the properties and behaviour of construction's most fundamental materials (metals, cement and concrete, polymers, timber, bricks and blocks, glass and plaster). In particular, the critical factors affecting in situ materials are examined, such as deterioration and the behaviour and durability of materials under performance. An accessible, easy-to-follow approach makes this book ideal for all diploma and undergraduate students on construction-related courses taking a module in construction materials. Ash Ahmed is a senior lecturer in construction materials science and module leader of several undergraduate and postgraduate materials science modules at the School of the Built Environment and Engineering at Leeds Beckett University. His research specialises in the evaluation of the mechanical and physical properties of commercial materials as well as novel sustainable materials in civil engineering. John Sturges is a visiting professor at the School of the Built Environment and Engineering at Leeds Beckett University. His research interests include the environmental impact of materials, the energy efficiency of buildings and the whole area of sustainability and its impact on UK industry.